While preventive dentistry is always our top priority, even the most thorough dental care routine can fall short. When decay or damage occurs, we offer a wide variety of treatment options to fully restore the form and function of damaged smiles quickly and comfortably including CEREC single visit dental restorations. If you’ve experienced tooth decay or damage or it’s time for your six month dental checkup, contact our team to schedule an appointment. We welcome patients from Crookston, Red Lake Falls, and other nearby communities. Dental crowns are the most commonly recommend restorative dentistry services. This versatile treatment can be used to correct severely damaged or decayed teeth, conceal purely cosmetic flaws, protect teeth that have undergone root canal therapy, replace a single tooth when attached to a dental implant, and support a fixed bridge restoration when placed over the teeth on either side of the replacement tooth. Most of the crowns and bridges we place are crafted using our in-office CEREC system allowing us to design, mill, and place a restoration in just one visit. Partial and full dentures are necessary for those patients who have experienced significant tooth loss. Partial dentures are made from a number of replacement teeth set into a gum colored base. 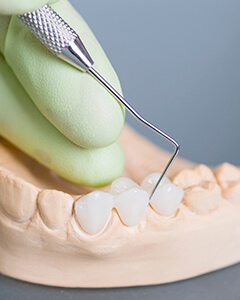 Partials are held in place using metal clasps affixed to remaining healthy teeth. Full dentures replace an entire arch of teeth. A row of prosthetic teeth are set into a gum colored base that is shaped to fit snuggly onto the gums and jawbone structure creating suction that holds the prosthetic in place. We are also happy to discuss dental implant supported partials and dentures for those interested in a more stable solution. Root canals are necessary when dental decay or damage reaches the interior pulp layer of teeth where the nerve is housed. A root canal is a procedure to remove the damaged pulp and nerve reducing pain and restoring health to the tooth. In some cases, our team is able to safely and effectively complete these treatments, but for more advanced cases, we partner with local endodontic specialists to ensure patients get the high quality care they deserve.